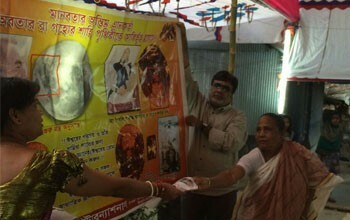 On the 25th of June, 2014, a delegation from Kalki Avatar Foundation Bangladesh were invited to deliver the message of Kalki Avatar Ra Gohar Shahi at the Munshiganj District in Bikrumpur central Bangladesh. The programme was arranged by Mr Manoraj Das, who was extremely pleased to hear our about our message. Approximately 100 people attended the program and received Kalki Avatar’s message wholeheartedly. It was a great success; an overwhelming amount of aspirants showed deep gratitude upon receiving our message!